A faded or damaged SMV emblem should be replaced immediately with a new emblem. 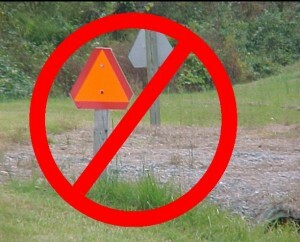 Old signs should be replaced with the new standard (S276.5). Dusty and muddy signs should be cleaned. 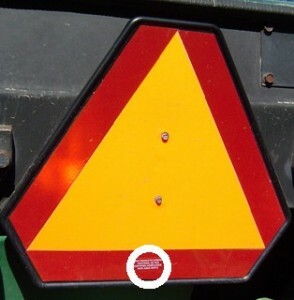 The SMV emblem indicates a vehicle traveling less than 25 mph and should not be used as a stationary marker for fences, driveways, or mail boxes. 2. 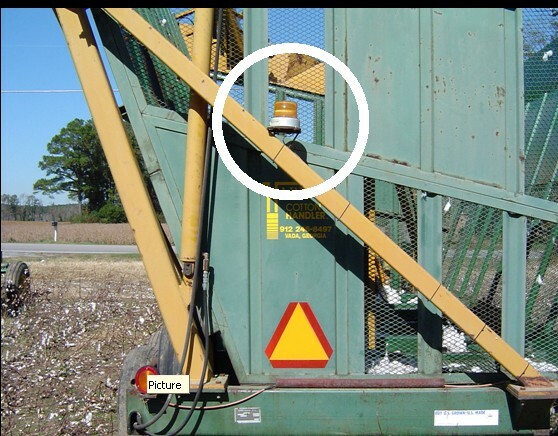 Add reflective tapeAgricultural equipment should be marked with reflective tape that meets the ASAE S279.12 standard. 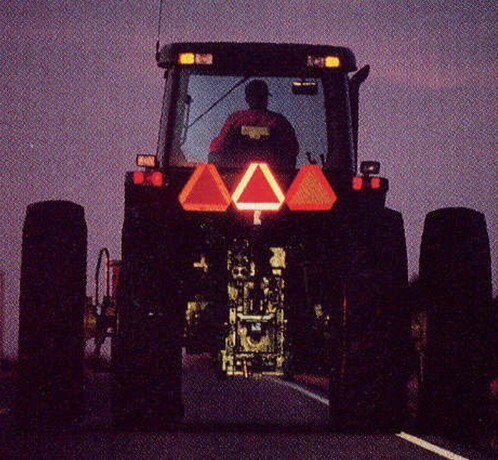 These tapes have 5 times the reflective power of conventional reflective tapes. On the back of equipmentRed retroreflective and orange fluorescent tape strips should be mounted horizontally, in a side-by-side configuration. 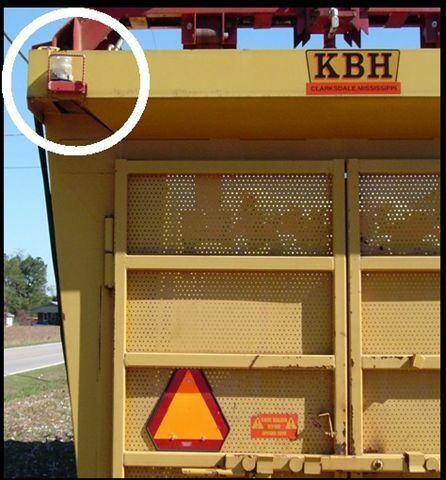 One 2 x 9 inch strip of red retroreflective material should be placed on both the far left and far right of the equipment. A 2 x 9 inch orange fluorescent strip should be placed in a line next to each red retroreflective strip. 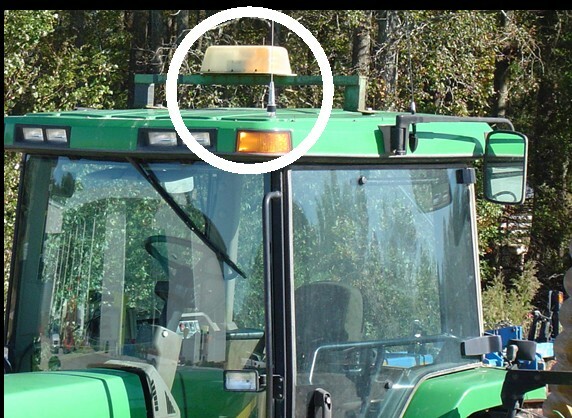 On the side of equipmentYellow retroreflective strips (2 x 9 inches) should be mounted on the front and sides of the farm equipment at the corners. Attaching a permanently mounted strobe light to a farm tractor or implement will further alert drivers to the presence of a slow moving vehicle. 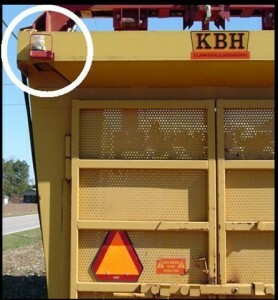 Drivers are accustomed to seeing flashing lights and beacons on vehicles that require special attention. Be Seen and Be Safe is sponsored by the Edgecombe, Greene, Johnston, Nash, Pitt, Wayne, and Wilson Centers of the North Carolina Cooperative Extension Service and the North Carolina State Highway Patrol with funding from the North Carolina Tobacco Trust Fund Commission.